2011 is the third vintage of Contra, an "old-vine field blend" of primarily Carignane, Mourvèdre and Zinfandel. Bonny Doon's Randall Grahm writes that the grapes come from "the sandy, head-trained, dry-farmed vineyards of Oakley and Antioch in the Sacramento Delta of Contra Costa County." This vintage is, as Grahm says, "a happy medium between the mineral-driven '09 and the riper '10." The wine's name suggests not only the county in which the grapes were grown, but the Nicaraguan opposition forces funded by the US government. I don't think Bonny Doon is being subsidized by the feds, but now that I'm thinking of it, Grahm's Twitter communication seemed to drop off after the guvmint shutdown. For all I know, Carignane, Mourvèdre and Zinfandel could be code names for three old rebels still hiding out in the fields. The couch-in-the-vineyard imagery on the wine's label suggests that one could get comfortable amongst those gnarly old vines, or at least in the presence of their fruit. 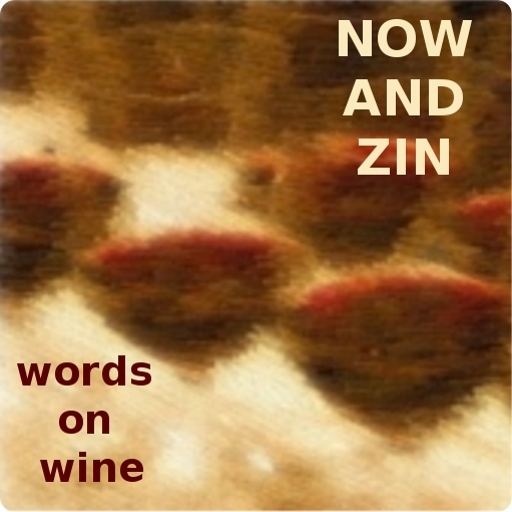 Grahm calls Contra one of the "straightforward and frank wines of yester- and future-year." When I came across that nugget on the label it didn't sound the least bit unusual, possibly because of the spaceship hovering near the words. I don't know what the future holds, but I sure get a sense of the past in this wine. Contra is, specifically, 56% Carignane, 28% Mourvèdre, 9% Grenache, 6% Syrah and 1% Zinfandel. Grahm calls it a "contrarian blend of old-fangled grape varieties from mostly older vineyards." The varietal makeup certainly harkens back to California's gold rush era and the field blends of that day. Although field blends are referenced here, it's not a true field blend, since the grapes were vinified separately. 2,256 cases were made, and it retails for an affordable $16. Alcohol sits at a very respectable 13.5% abv. Inky purple, Contra displays a dark and brooding nose full of currant, anise and all the dark fruit that's lying around. It's wonderfully pungent and even a tad funky - I guess that's how they roll in the Contra Costa. Sipping it shows a distinct mineral note running right through the middle of the blackberry, cassis and black licorice flavors. Acidity is great, tannins are round and the wine goes down very smoothly with notes of cinnamon and allspice. The finish is extraordinary - and extraordinarily long. The warm east end of Santa Barbara County's Santa Ynez Valley - the Happy Canyon of Santa Barbara AVA - is recognized as a great place for growing Bordeaux grape varieties. Cimarone Wines has a patch of an Italian variety there, of which they are fairly proud. Cimarone's Gran Premio is made from 100% estate-grown Sangiovese grapes, a blend of two clones from Three Creek Vineyard in Happy Canyon. I wrote here about the 2008 Gran Premio. Like the '08, the 2009 vintage is vinified in barrique open top wood fermenters. It hits 14.5% abv in alcohol and retails for $30. 195 cases were produced, each bottle numbered. The '09 strikes me as much more fruit-driven than the previous vintage. Cimarone advises that some age will definitely do good things to this wine. Gran Premio is named to invoke the wild raciness of Italian Formula One drivers. Doug Margerum was the winemaker, although Andrew Murray has stepped into that role at Cimarone. Aromas of fresh plums and cherries jump from the glass carrying a little alcohol and a bit of tar. Some tobacco and spice creep in, too, but it's really more about the fruit. Speaking of, the palate is fruit forward. That means ripe fruit forward. It's a bushel basket of blackberry, plum, strawberry and cherry all mixed together. A hint of smoky, tarry clove leads the charge of the spice brigade. It may not be very Italian, but it's not meant to be. The Cimarone Sangiovese grapes, like the Bordeaux varieties grown in Happy Canyon, wear their California hearts on their rolled-up Chambray sleeves. Pair it with a Bolognese pasta if you like, but it will go just as well with steaks, chix and chops - as the sign on the steakhouse door used to say. Some winemakers see trouble when they produce a non-vintage wine. Vintage, after all, is a prime factor to which wine lovers look when determining the quality of a wine. Perhaps more important in wines from French regions than in those from California's warmer locales, the vintage has become blurred in Hope Family Wines' Troublemaker red blend produced in Paso Robles. The winery's website calls Troublemaker "a blend crafted from multiple varietals and vintages. The majority of wine comes from 2011 vintage, with a remaining portion coming from 2010. By using a multi-vintage approach, winemaker Austin Hope allows the wine to show uncanny complexity in its youth, yet rich and fruit-forward characteristics that make it ready upon release." The blend is 50% Syrah, 20% Grenache, 10% Mourvèdre, 10% Zinfandel and 10 % Petite Sirah, from California's expansive Central Coast appellation. The wine kicks 14.5% on the alcohol meter and retails for $20. I was provided a sample from a publicist. The grapes involved bring forth the attributes for which they are known. Troublemaker is a very dark-colored wine, with an extremely fragrant nose of black currant, blueberry, vanilla spice and cinnamon. There is quite a show of Syrah, Zinfandel, Mourvèdre and Petite Syrah. On the palate, a rich and ripe fruit display shows dark fruit in the form of plums and blackberries. Spicy with the nice acidity one would expect in a Grenache, and with firm tannins, the wine is smooth enough to provide enjoyment as a sipper while maintaining good structure to allow for pairing with some meaty dishes. If you are looking for a nice, affordable red to put on the holiday table, this Troublemaker won't cause any trouble in that setting. As the "original Rhône Ranger" in California, one might expect Bonny Doon Vineyards' Randall Grahm to present a Syrah that is something more than acceptable. With his Jespersen Vineyard release, he keeps his streak of extraordinary Syrahs intact. Jespersen Vineyard is a fairly new vineyard located close to the coast in the Edna Valley region of San Luis Obispo County. Edna Valley is one of my favorite mineral-laden wine regions in California, and I know Grahm appreciates minerality in wine, wherever it comes from. On the label, Grahm waxes jazzy poetic about the "coolth" of Jespersen Vineyard and of Edna Valley as a whole. He likes the cool climate grapes there and the depth of the wines made from them. He feels his 2010 Jespersen Vineyard Syrah shows the brilliance of cool climate grapes. 483 cases were made with a per-bottle price tag of $40, although the wine was produced primarily for the Bonny Doon wine club, DEWN. Alcohol comes in as moderate at 12.7% abv. The color of this Syrah is deep and dark. The nose beckons from across the table - vast blueberry, blackberry and plum with an aroma at once minty and tarry draped over the fruit basket. Big, dark fruit dominates the palate with a eucalyptus note often found in cool-climate Syrah. The wine shows remarkable acidity, another touchstone for Grahm's wines. Pair this one with anything meaty, beefy or gamy and you should be pleased. Sip it and ruminate on it, and you will find pleasure in that, too. For a state with as much winemaking heritage as you will find in Pennsylvania, they lag far behind most states in embracing laws favorable to wine consumers. Things appear to be shifting there, but the movement is slow. 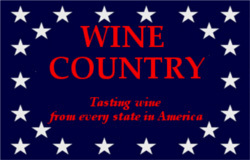 While tasting wine from all parts of the US for the Now And Zin Wine Country series, I have had the opportunity to sample Pennsylvania wine several times. Some has been good, while some has been merely tolerable. The samples from Lakeview Cellars definitely fall into the "good" category. Lakeview Cellars is a boutique Pennsylvania winery located just south of I-90 in the town of Northeast, PA, which is actually in northwest PA. The directional aspect of the town's name describes its situation within Erie County. The winery offers visitors some great views of Lake Erie and a pond shaped like a wine bottle - in addition to their wines, of course. Owner and winemaker Sam Best sent two bottles of his very popular Shipwreck Series, a red and a white, for me to sample. This Lake Erie red blend uses five grape varieties: Baco Noir, Cabernet Franc, Chambourcin, Cabernet Sauvignon and Noiret. Cabernets Franc and Sauvignon you know. The other three grapes are hybrids found mainly in the American northeast. Baco Noir is a cross of the French vitis vinifera grape Folle Blanche and an unknown variety of vitis riparia indigenous to North America. Chambourcin and Noiret are also hybrid grapes. Best says, "The wine is finished with 1% residual sugar, and exhibits nice fruit forward and finishes with some oak tones." Sure enough, it's a dry wine at 12.4% abv, fermented and aged in Pennsylvania white oak. It sells for $17, when they have some to sell. This vintage ran out in September this year, nine months after its release. Medium-dark ruby in the glass, the nose is complex, with black plum and blackberry, a little cinnamon and allspice, cigar tobacco and even a bit of leather. The sip reveals a beautiful, peppery raspberry delight. It's a little bit Pinot, a little bit rock'n'roll. The Baco Noir and Chambourcin grapes seem to shine the brightest. Best says he aimed for crisp and semi sweet with the Shipwreck White. He hit the mark well. Notes of melon and citrus come through an earthy nose, while similar fruit adorns the palate. It strikes me as having just a hint of sweetness, a little odd for a wine with 3.5% residual sugar. Best explains, "We blended this wine to have a nice balance of fruits and acid and finish with a honeydew melon taste. The wine was finished with 3.5% residual sugar, but because of the acid, it doesn’t come across as sweet." This blend of Riesling, Vignoles, Cayuga and Vidal retails for $14 and barely tips the alcohol meter at 12% abv. The earthiness on the noise is amazing. The way the minerals, sugar and acidity merge is equally stunning. It goes great with almonds and a cheese plate, but it makes a great sipper, too. Recently we wrote about some South African wines, and now - before the Northern Hemisphere sun grows too faint to warm us, let's try the beach house Sauvignon Blanc. It is actually a blend of 85% Sauvignon Blanc and 15% Semillon grapes from South Africa's Western Cape, clocking in at 12% abv and retailing for $10. Made by Douglas Green, one of South Africa's largest independent wine producers, the beach house has a presence in 80 countries and is imported in the US by Pacific Highway Wines and Spirits. It is labeled as "perfect for sitting out in the sun, on the porch or even better... on the beach." Even if the season in your hemisphere does not cooperate, it's perfectly fine to enjoy this wine indoors. Pale straw yellow in the glass, the wine's nose is full of bright citrus and minerals. There is hardly a blade of grass to be found. On the palate, grapefruit, Mandarin orange and lime peel dominate in a fruity and easy-to-drink setting that also includes a fairly strident acidity. There is just a hint of that South African terroir - it is really a refreshing and fruit-forward wine. Pair it with grilled calamari - the more charred the better, salads and Feta cheese. It's even good with sausage and peppers.